Great for small ponds with low head applications. A combination of high performance flow with a low maintenance design & 3-YEAR WARRANTY! This Generation 2 (Gen 2) pump design accomplishes what most other pumps only aspire to achive. The combination of high preformance flow with a low maintenance design. Drop it right in your pond and let it flow! A durable protective intake cage body surrounding the high efficiency magnetic drive pump helps protects the pump from clogging from debris, reducing the frequency the pump has to be removed for maintenance. A great pump to pair up with any pressure biological filter. 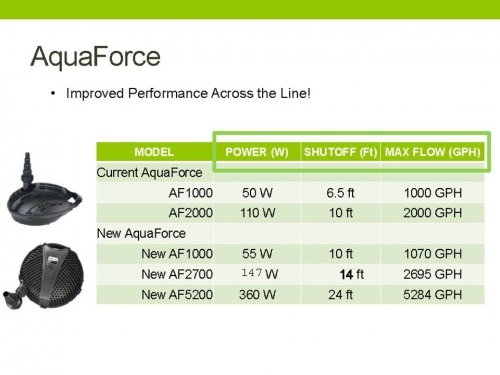 The AquaForce™ Solids Handling Pump combines high performance flow with a low maintenance design ... perfect for applications that don't require a skimmer. The ceramic shaft and graphite-injected molded bearings makes this pump virtually indestructible. 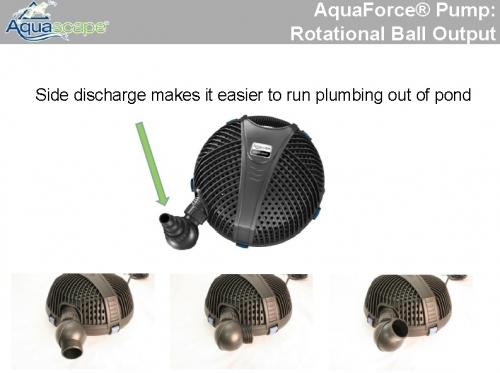 The AquaForce™ can be paired with the UltraKlean™ pressure filters, and is available in 1000, 2700, and 5200 gph models, complete with a three-year warranty. These pumps are ideal for smaller ponds with short waterfalls. The pump includes one (1) 1.5" Rotational Ball Output, (1) 1.5", 2" Multi Hose Adapter, & (1) 3/4", 1", 1.25" Multi Hose Adapter to fit all applications. They're easy to use, just set in a skimmer, connect the out flow pipe to the waterfall, and watch the pump do the work. All pumps in ADIs' product line are specifically designed to support the demanding requirement for 24 hour/7days a week operating condition of a water garden. Continuous operation heightens the importance of proper pump selection to minimize power consumption yet deliver enough flow to produce the natural sights and sounds of a beautiful water feature. 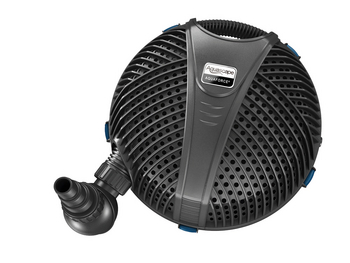 Order an AquaForce pump between 3/15/14 - 5/31/14 and receive a $25 Prepaid VISA card with mail-in rebate! 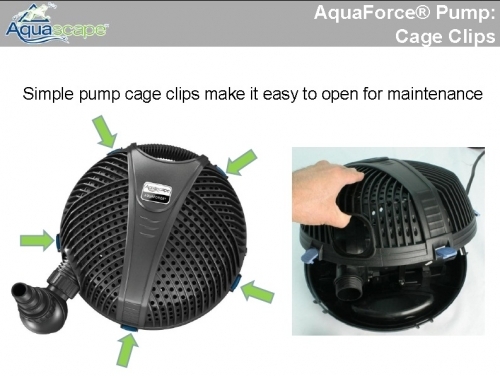 3/4, 1, 1.25, 1.5, & 2"
To view the written 16 page AquaForce Pump Instruction Manual (English & French) in a Down-loadable PDF file that can be printed, click on the link "DOWNLOAD MANUAL"
From Victor Standiford of FAIRFIELD, California on 3/14/2014 .